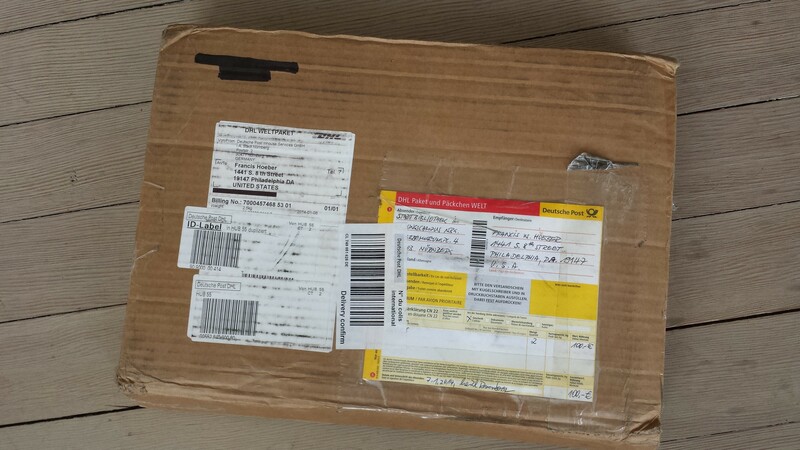 Package from the Collection of the Jewish Community of Nuremberg, housed at the Nuremberg City Library, received February 2014. Julius Streicher was hanged on October 16, 1946 following his conviction by the international war crimes tribunal in Nuremberg. Streicher’s headquarters were in Nuremberg, where Hitler held rallies to whip up fervor for his dictatorship. Streicher’s particular charge was was to stoke Germans’ hatred of Jews. To this end, Streicher published a weekly magazine, Der Stürmer, a pornographically vicious hate sheet directed at Jews. He was also famous as a speaker given to lengthy antisemitic harangues. Perversely, while overseeing propaganda against Jews Streicher acquired a large and valuable library of Judaica. From the earliest years of Nazi rule party officials routinely stole property from Jews and others out of favor with the regime. Streicher pursued manuscripts and books relating to Jewish religion, history and culture. By the time the Nazis fell in 1945, Streicher had accumulated more than 30,000 volumes. At the end of the war, the Allies seized Streicher’s library and turned about 10,000 of the books over to the remnants of the Jewish community of Nuremberg, called the Israelitische Kultusgemeinde, or IKG. Decades later, lacking the facilities to care properly for their collection, the IKG negotiated a loan arrangement to have the Nuremberg City Library house it. 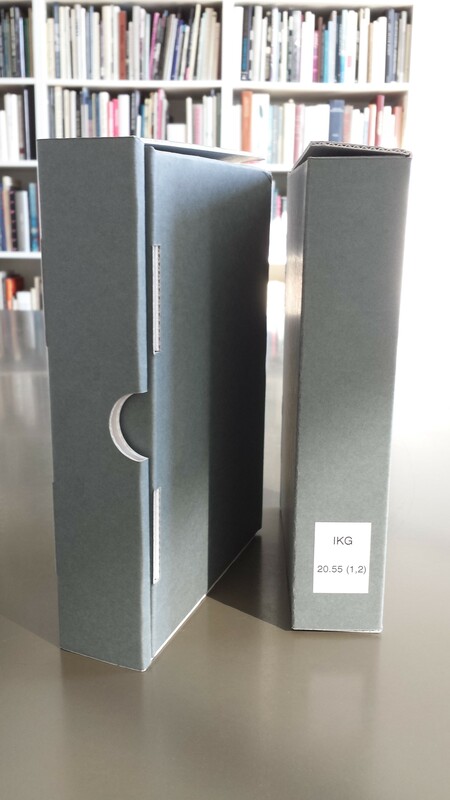 The IKG remains the legal owner and has a designated librarian to oversee the collection on its behalf. The IKG considers itself the trustee for the original owners and has lovingly cared for and preserved the books. Over the years some of the books were claimed by the descendants of the original owners, most of whom had been killed or forced to flee. Beginning in the 1990s, more aggressive efforts were made to find identifying marks in the books that might give some clue as to the original owners. With the advent of the Internet, the IKG posted the first of a number of search lists online with identifying information about the books and their possible previous owners. Readers of this blog know that I have been researching my family’s history for the last several years. In the course of this work last fall I was trying to track the sister of my great-great grandmother. The sister was born Bernhardine Oppenheim and married a Berlin jeweler named Heinrich Friedeberg. I had no reason to think that Heinrich and Bernhardine had done anything that would cause them to be in some historic record, but I nevertheless Googled their names. The result was astonishing. The first hit was the lost books list of the IKG in Nuremberg. It seems that two volumes of the Collected Writings of Abraham Geiger were stolen by the Nazis from a descendant of Heinrich and Bernhardine Friedeberg. Geiger was one of the founders of Reform Judaism and a close friend of Bernhardine’s brother. The stolen books ended up in Julius Streicher’s hoard of Judaica and after his execution went to the IKG. I wrote to the IKG and asked for a further description of the books and their history, and received a gracious email in return from Leibl Rosenberg, the erudite curator of the IKG collection. Herr Rosenberg sent scans of the Friedebergs’ bookplate and Bernhardine’s signature taken from one of the volumes of Geiger’s work in the IKG collection. Herr Rosenberg’s email concluded with the unanticipated observation that I might well be the closest living relative of the Friedebergs. He invited me to confirm that fact and to start the restitution process to have the books returned — to me. 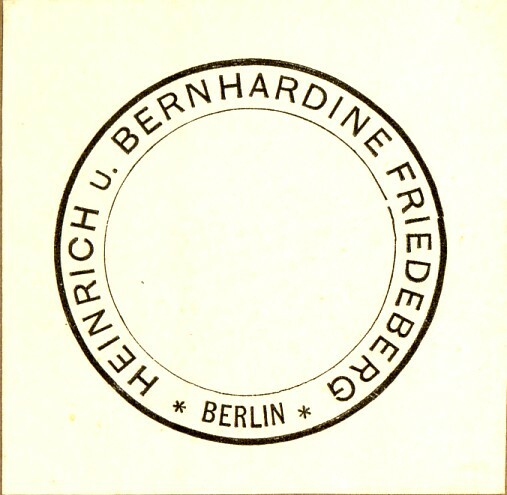 Heinrich and Bernhardine Friedeberg’s bookplate from a volume of the Collected Writings of Abraham Geiger. Bernhardine Friedeberg’s signature from the title page of the Collected Writings of Abraham Geiger. It did not take me long to respond to Herr Rosenberg. I expressed my gratitude and sent him a copy of a genealogy chart handwritten by my grandfather in 1928 showing our family’s relationship to the Friedebergs along with other documents from my family’s archive. In response, Herr Rosenberg sent me an agreement acknowledging my receipt of the books. I signed it and returned it to him and a few weeks later received the package pictured at the top of this page. I am now the custodian of these books and of their poignant history. I am entrusted with caring for them and preserving them as the Jewish Community of Nuremberg and the Nuremberg City Library have done for all these years. 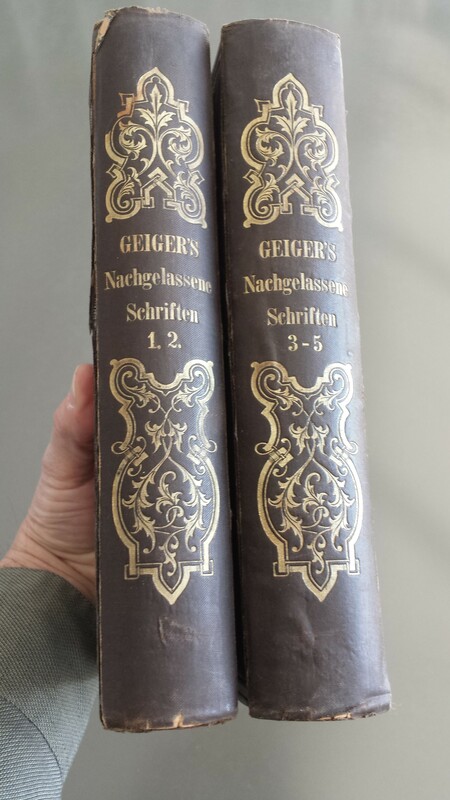 The Collected Writings of Abraham Geiger preserved by the Jewish Community (IKG) of Nuremberg and returned to me on behalf of their original owners, Heinrich and Bernhardine Friedeberg. Of all the adventures I have had in researching and writing about the Hoeber Family, this is perhaps the most moving and unexpected. 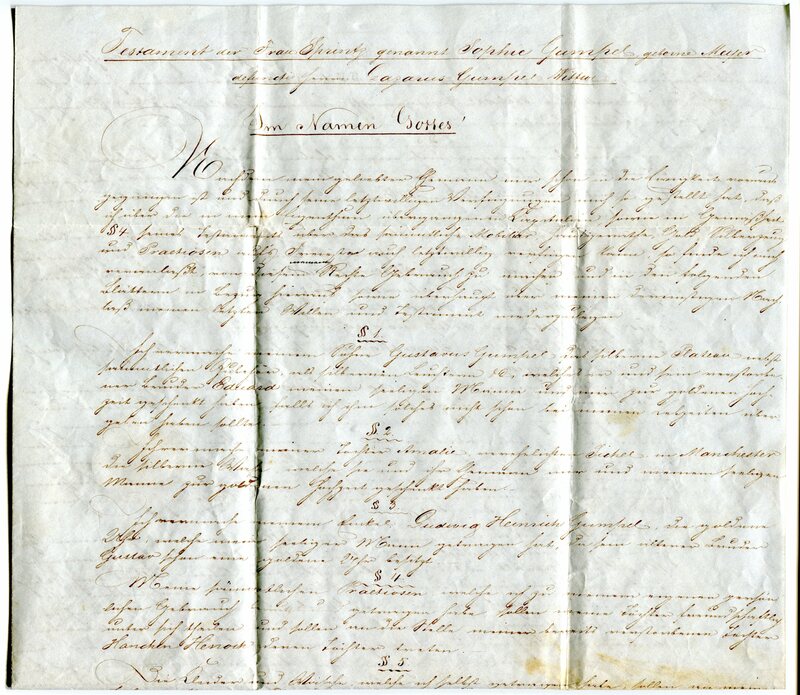 Copy of the Will of Sophie Gumpel dated February 12, 1844. Click on image to enlarge. I am descended from a long line of women for whom nontraditional roles were a tradition. My mother was a PhD economist. My grandmother was a physician an biochemical research scientist. My great grandmother was a portrait artist of more than usual accomplishment, and apparently so was my great-great grandmother. The earliest proponent of of women’s equality I have found so far in my family, however, is my great-great-great-grandmother, Sophie Gumpel (died 1846). Sophie Gumpel (née Meyer) was the wife of the Hamburg businessman, banker and philanthropist Lazarus Gumpel (1770-1843). Although the records are incomplete, Sophie and Lazarus had at least five children, three daughters and two sons. Lazarus was himself a progressive and charitable man, devoting a good portion of his fortune to building a large apartment house in Hamburg to provide subsidized housing for poor families in the city. He was also one of the founders of the first Reformed Jewish congregation in Hamburg, significantly leading in modernizing Jewish religious practice, including greater participation for women in the liturgy. When Lazarus died, he was buried in the Jewish cemetery in Hamburg-Ohlsdorf. A modern gravestone replaces the original . 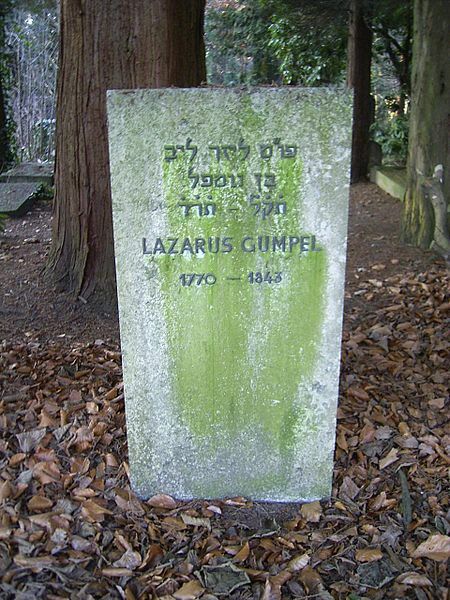 Modern grave marker of Lazarus Gumpel (1770-1843), husband of Sophie Gumpel, in the Jewish cemetery in Hamburg. Since the rules of Jewish law, which give preferred status to sons over daughters, are not acceptable to me, who always loved all of my children equally, I declare herewith, as I am legally authorized to do, that I constitute all of my children my heirs, and in the case that one should have predeceased me then his or her marital offspring shall take his or her place per stirpes. To all these my heirs I leave my entire estate in equal parts without exception, including furniture, household inventory, linen, gold and silver. Should any of my designated heirs, for whatever reason, not recognize this will or contest its validity, he shall be totally excluded from any right in my estate, and the share left to him shall go to the other heirs who will honor and recognize my will. The value of the estate, by the way, came to some 52,000 Taler, the equivalent of an estate of millions of dollars today, providing plenty for everyone.